Who wants some healthy comfort food? So looks like we’ve almost made it through the first month of the year. How are your health goals going to far? Hopefully you’ve started the year off with some positive health habits. I love how motivated everyone gets at the beginning of the year. All of my yoga classes are jammed packed. I see tons of folks when I’m out for my morning hike. People seem to dig all of my healthy recipes. It’s like we are all united in our quest to be vital. I love it! And healthy living doesn’t have to feel like deprivation. Especially when it comes to food. We don’t have to eat just salads and green smoothies. (Confession: I RARELY eat salad in the winter. It’s WAY to cold for me.) There’s room for a bit of comfort food in there. Doesn’t that look good? Creamy, yummy deliciousness. 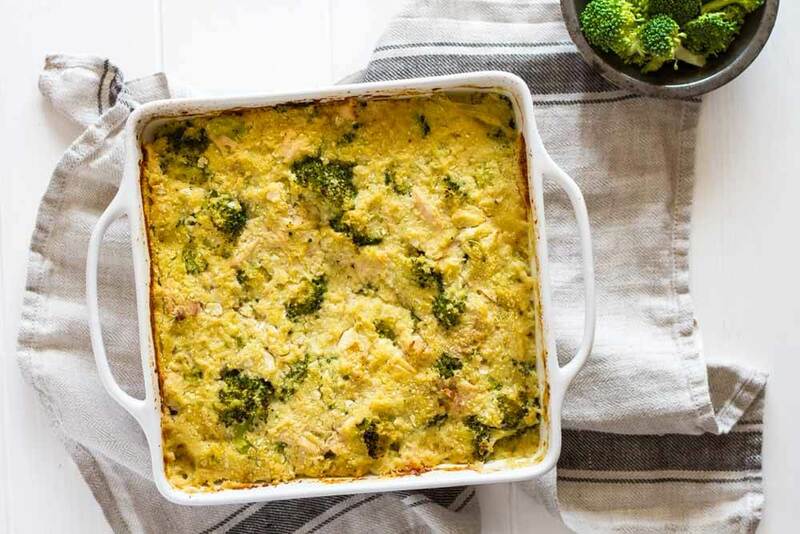 This creamy chicken broccoli cauliflower rice casserole may have a long name, but it’s super easy to throw together. Once you’ve prepped your veggies, the only thing you have to make is the sauce. The casserole just bakes itself after that. 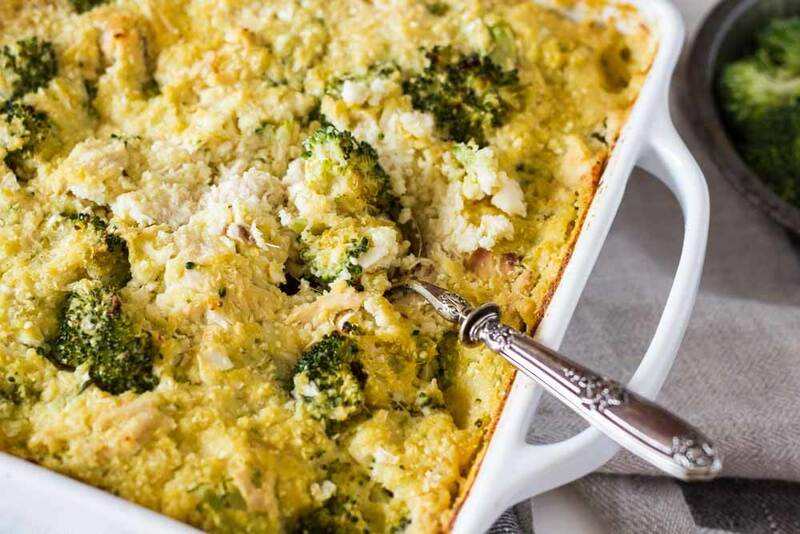 The ingredients are surprisingly simple: chicken, cauliflower and broccoli. All baked together in a creamy dairy free sauce. The ultimate comfort food – without the junk. a ridiculously creamy (and slightly “cheesy” tasting) sauce that will soothe any soul. 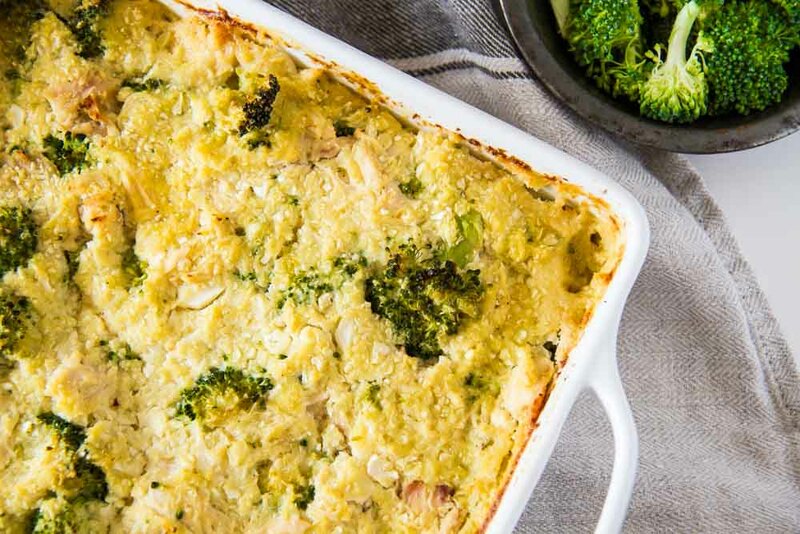 loaded with cauliflower and broccoli, so you know you’re getting your daily dose of veggies. good protein from chicken (or any other meat that makes you happy.) I’ve used ground beef and bacon. Both were delish. happy family. This recipe is family-approved. 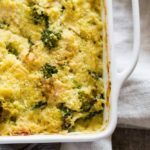 Who doesn’t love a creamy casserole on a chilly winter evening? makes great leftovers. So good in the morning with a couple of perfect 6 minute eggs. freezes well. Freeze leftovers for a healthy lunch later in the week. Or make a double batch and keep one in the freezer for a busy weeknight. find the biggest cauliflower you can find. You’ll need 6 cups of cauliflower rice for this recipe. One very large cauliflower should give you about 6 cups of cauliflower rice. remove bottom stem and leaves, as well as any brown spots on your cauliflower. Then chop it into 4 even sections. Cut out the super thick core from each piece and break up florets into even pieces. Preheat oven to 400’F. Liberally grease a 9×9 pan. 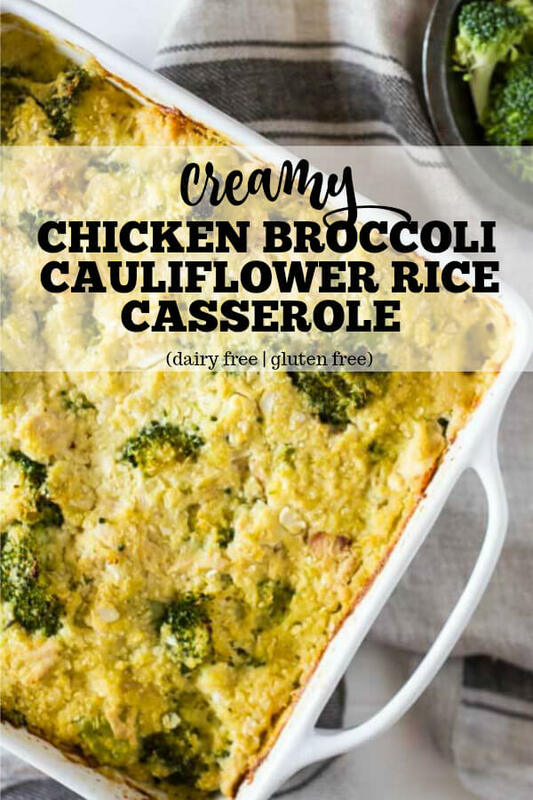 In a large bowl, combine 4 cups of cauliflower rice, broccoli florets, and shredded chicken. Place mixture into prepared baking dish. Set aside while you prepare sauce. TO MAKE CREAM SAUCE: In a medium pan, melt fat of choice over medium heat and add onions. Cook for 3 minutes to soften. Add two cups cauliflower rice, garlic, and salt and cook for another 4-5 minutes. Remove from heat and add broth, milk, nutritional yeast, and pepper. With an immersion hand blender (or regular blender), puree sauce until creamy smooth. Scoop out about 1/2 cup of the sauce into a cup and whisk in arrowroot powder until completely smooth. Reheat remaining sauce until steaming but not boiling and whisk in arrowroot powder mixture. Continue whisking for a couple of minutes as the sauce begins to thicken. Pour thickened sauce over casserole and shake baking dish to evenly disperse. You may need to fold mixture a bit to get sauce to evenly coat veggies. Bake for 45 minutes, until bubbly and golden. You will need 6 cups of cauliflower “rice” for this recipe. One very large cauliflower yields about 6 cups. This casserole is very versatile. Feel free to add any flavors that you like. I’ve added fresh basil with the broccoli. I’ve added cumin and chili powder to the cream sauce. 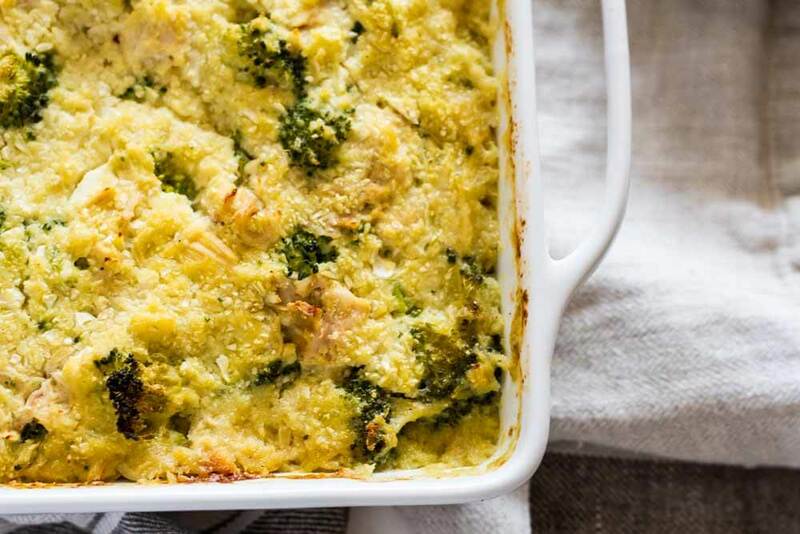 And if cheese is your thing, this casserole is uh-may-zing with a bit of Parmesan. Can I omit the arrowroot powder? Would it make a big difference do you think? Looks amazing! I want to make, but I have a question. You use pre-cooked chicken right? This sounds so freaking scrumptious! I love this recipe. Thanks for sharing. Do you cover the casserole when baking it?? HI, Maureen. I don’t calculate, but you can use this is you want to know —-> https://www.myfitnesspal.com/ 🙂 Hope that helps! Help! Love it and have made it many times but this time I have no veggie or bone broth. Can I use chicken? ?